You are here: Contests / What Are You Fighting For? Legends! In honor of #MissMeMore, we want to know what YOU’RE fighting for. Post a photo below inspired by the “Miss Me More” video and include a caption describing what you’re fighting for, for the chance to win a KB t-shirt! 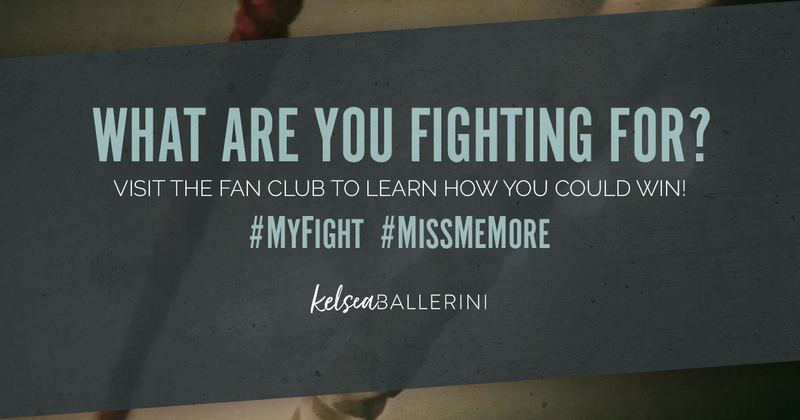 Bonus points if you share your story to Instagram and/or Twitter using the hashtags #MissMeMore and #MyFight and including the link to the “Miss Me More” video. Good luck, Legends! I’m fighting 2 yrs since my Grandpa passed away. Where do I begin? Finding out he had pancreatic cancer and could only live up to 6 weeks was heartbreaking. I was by his side the whole time when he passed closer to the holidays. Things were rough and really hard at times. Not a day goes by without my Grandpa and loving him so much. I’m fighting for all the women and girls that fighting through sexual, verbal, physical, and emotional abuse everyday! I’m working on getting my masters in social work to become a better advocate and educator for all of those women and girls! Be strong, hang on! #missmemore! I'm fighting for end of bullying. I was always bullied in high school, and I can't stand it!!! I’m fighting for end to neroufibromotis , I am 1 in 3,000 it’s more common than cystic fibrosis but less known. It’s uncurable and very few treatments. It effects people in many ways, learning , motor skills , scoliosis , kyfousu , growing tumors on nerves and much more. I was born with NF1. I deal with all of these things , I have a lot of painful tumors growing on my nerves and I’m in pain all the time , everyday is a fight to get up but I do it and that is my fight. "More than 25 percent of law students have had psychiatric and substance use disorders, and most don’t seek professional help." This year is my second year at law school, and more than ever, I've realized the effects that mental health issues can have on law students. After realizing how inaccessible mental health help is at my university, I vowed to make a change. For this academic year, I became president of my law school's Disability and Mental Health Law Club. For the first time ever at our law school, I spearheaded a mental health celebration on World Mental Health Day. Along with the executive committee I put together, we made 100 care packages for law students, and made a "take a positive note, leave a positive note" sticky board in our law student lounge. We wanted to encourage students to motivate and cheer up others, while also supporting those who needed a little positive reminder. As well, I am currently in the process of fighting for increased mental health resources at my school. Together with two of my peers, we have put together a report summarizing the inadequacy of mental health resources at the school generally, and specifically for law students. We are currently meeting with individuals who allocate funding for such resources, and are fighting for more resources for students on campus. What is #MyFight? To improve access to mental health support on my campus, and hopefully one day all over the country. This past year has been the most difficult year of my life thus far. October 28, 2017, was one the mountaintop moments of my life! I was one of the few people who got to attend Kelsea’s Knoxville Homecoming Album Release Celebration at Central High School! Little did I know, my life would be changed forever one month later. On November 28, 2017, while crossing the street at night coming home from a college basketball game, I was hit by a car. In the accident, I sulfured multiple abrasions to my face and hands, and a concussion to the frontal lobe. I also developed major Post Dramatic Stress Disorder, and depression from the trauma and brain injury. You should probably know that I was born three months prematurely, and I have a condition known as cerebral palsy. This condition affects both of my legs, my right arm, and right hand. I cannot walk at all without assistance from a walker. For long distances, I use a motorized scooter to get from place to place. It will be a year on November 28th since my accident, I am am still recovering. I have come a long way from spending six days in the regular hospital, and 17 days in an In-Patient Rehabilitation facility. I still have a long way to go because with my disability it takes me longer to recover. I am thankful to the Lord that I made it through, and for Kelsea continuing to keep me going, and inspired through her music. She is so special, and possesses that special quality that no artist in the music industry has! Watch the Official Music Video for “Miss Me More” HERE: https://youtu.be/2ll1DrlZgqk ?? I'm fighting daily to strive to be better than the woman inwas yesterday! I have struggled through abusive relationships and learned that through them I lost who I truly was as an individual and learned that leaving people behind that did not support you and make you feel like you were worth something is when you realize in the midst of the madness you forgot who you were and what it ment to be happy and when you finally find yourself again you realize what's important and that's your happiness and self worth and confidence that every woman should have for themselves. I’m never good at short captions so here’s the link to the full thing, thanks for this video and being a constant reminder of why I keep fighting and to never give up.